Can't attend? Follow The Façade - Vanity EP Launch to know of future events! 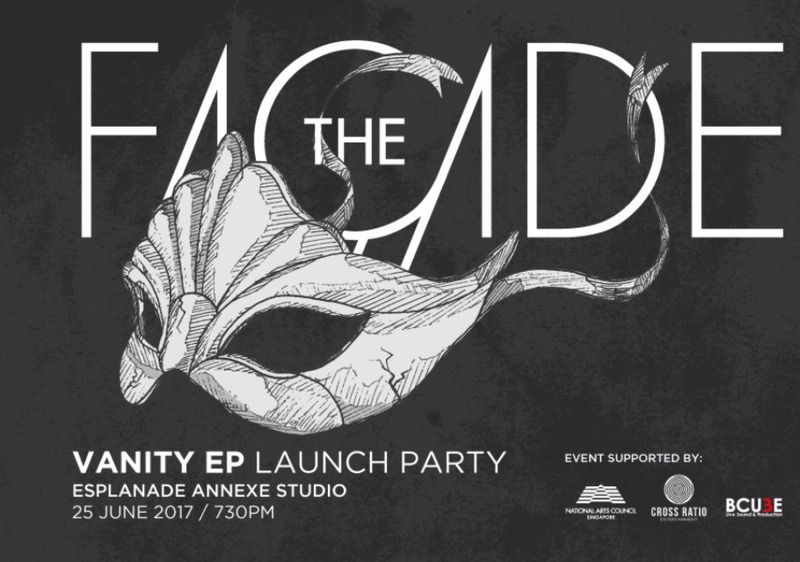 Singaporean alternative pop band, The Façade, are proud to announce the launch showcase for their debut EP ‘Vanity’ at Esplanade Annexe Studio on 25 June 2017. The 'Vanity' EP explores the concept of growing up and the drama that follows careless youth, young hot-blooded rebellion, and the pains and wonders of transitioning into adulthood. Supported by National Arts Council, Cross Ratio Entertainment, and BCUBE Live Sound & Production, the EP launch showcase will see the band perform their debut album in its entirety for the first time, including their chart-topping original singles ‘Better Than This’ and ‘Victim’. Featured opening act: Electronic pop artist, Jasmine Sokko. Consisting of 4 entirely different individuals, local alternative pop band, The Façade, found its flavour: pop, rock, and a tinge of blues. Since the band's inception, they have performed at the Esplanade Outdoor Theatre, Esplanade Concert Hall, Sundown Marathon, Shine Festival, iLight Festival, Mediacorp Celebrate 2017 Countdown Party at Suntec City, just to name a few. Melodic tropes and groovy beats are signature to the band. In September 2016, the band released their debut original single 'Better Than This', which topped the overall iTunes chart at #2 within the first day of its release. The release of their second single 'Victim' has also claimed #4 on the iTunes alternative chart, and has more than 150,000 hits on Spotify.